May | 2007 | Why Run? Ballengee is one of the world’s top endurance athletes, most notably as a mountain runner and adventure racer. Last winter she was badly injured when she fell 50 feet down a rock face while on a training run with her dog, Taz, who wound up being instrumental in saving her life. This happened in December 2006, and doctors figured she’d need up to six months to heal her shattered hip before she could walk again. Well, guess who competed in a 12-hour adventure race under the name “How’s This For Rehab?” about a week ago? Five months later and she finished among the front-runners! In fact, some believe that her injuries at the time would’ve been fatal for most people. Not only did she survive, she recovered in remarkable fashion. Running sure is fun, but it can also be a great insurance policy even if running caused the malady. Go Danelle! 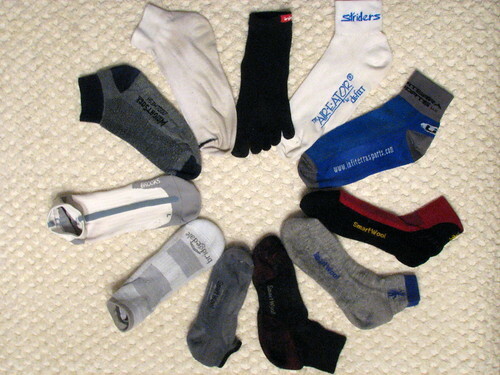 Four months ago I wrote the “Ultimate Running Sock Review” on my personal blog, hoping to share some of the knowledge I had acquired from running in 10 models of running socks (no, not all at once!) Every time I saw a new sock in a running store I wondered if it would be more comfortable than the last. Yeah, sometimes I have trouble making up my mind! Two days after writing that review I received a curious email, stating: “I’d love to get you some of Bridgedale’s newest socks to try! Interested?” Heck yeah! The mysterious messenger turned out to be a representative of Bridgedale – one of the brands of socks I reviewed – who had stumbled across my blog thanks to Google Alerts. (This rep also promotes nuun, an electrolyte product popular among adventure racers. Someday I hope to try some and maybe I’ll review them, too!) I replied with my shoe size and soon I received a package in the mail… three pairs of new socks! What you see are the X-Hale Trailhead (bottom pair) and the X-Hale Multisport (upper two pairs). The X-Hale series are made from a mix of merino wool, nylon, polypropylene and lycra. My first impression when putting them on was that they feel just like brand new Smartwool socks – amazingly soft! The Trailhead is a heavy sock with the orange parts being thickly padded. They are marketed as their “fastest and lightest hiking sock” so they aren’t truly a running sock, but they do fine in that role. The Trailhead is rather warm and I wouldn’t recommend it for above-freezing temperatures, but my feet really appreciated its warmth when I went for a run in subzero temps this winter. Bridgedale pitches the Multisport as “ideal for speed hiking, cycling, running & cross training” and they really should add “adventure racing” to that list. While much more breathable than the Trailhead, the Multisport is still a very warm sock and probably not suited to summer running in Michigan. I did wear a pair on today’s 5-mile run and my feet felt fine – it was 50 degrees outside. This sock does have some padding but much less than the Trailhead and has a lightweight feel on my feet. Both types of Bridgedale’s socks are great in wet conditions, even when my feet were completely soaked from running through deep streams on the trails. They don’t seem to be the best at evaporating sweat off my feet, but they did evaporate quickly enough to remain lightweight soon after giving them a good soaking. Not all socks can do this; in fact, the Brooks Adrenaline GTS Ped – one of my favorite socks from my first review – I subsequently discovered became quite soggy in a heavy downpour. This, despite the Brooks sock being very good at wicking away sweat in hot weather. One downside of both Bridgedale socks was that they exquisite softness I felt when I first put them on wore off rather quickly – the interior became a bit coarser after just a couple weeks. 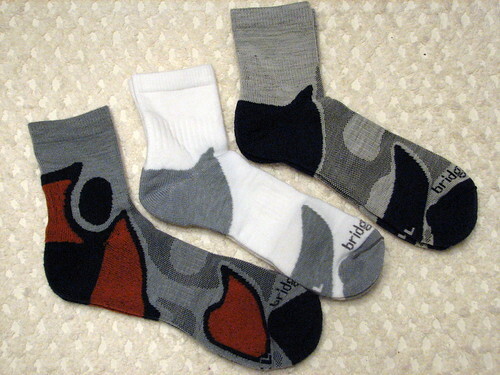 I’ve had the same problem with all of my Smartwool socks… except for my most recent pair, the red and black Smartwool Running Light Mini-Crew. I’d assumed in my last review that they would also roughen up, but they’ve actually held their softness very well and still feel great. Apparently Smartwool improved their construction? Along with losing some softness, the Bridgedales have a lot of long, loose-end threads on the inside of the sock which frequently caught my toenails when putting them on. They are the only runnings socks I have with this problem. On the bright side, a big plus of the Trailhead and Multisport socks is that they have a high ankle cuff. Typical running socks are low cut, which is fine when I’m running on paved roads. Off road on the trails, low-cut socks can sometimes allow trail debris (little pebbles, sticks, etc.) to get inside the sock because the low cut doesn’t snug to my ankle very tightly. The Bridgedale socks with their high cuff never let anything get into the sock; as a result of this and their ability to handle a good soaking and the Multisports are one of my favorite trail running socks unless it’s hot outside. For similar reasons I believe they would make a great adventure racing sock, too. Overall my current favorite running sock is the Smartwool Running Light Mini-Crew – it’s very breathable and keeps my feet cool even in warm weather, the inside is super soft, and they also insulate well in cold weather. I’ve worn these socks in temps ranging from 20 to 80 degrees F and my feet didn’t complain. They also dry out quickly when soaked. An excellent all-around running sock and it’s the sock I’ve used for all of my races this year. In summary, Bridgedale’s X-Hale Trailhead and Multisport socks are good but not great running socks. They could use some improvement in fabric quality and breathability in order to attract pure runners, but to be fair, Bridgedale is known for their hiking socks, not running socks. The Trailhead truly is an excellent hiker (I’ve done some hikes with it, too) and as I said, the lighter-weight Multisport would make a nice sock for adventure racers. They compare quite well with the Smartwool Adrenaline, which is also touted as a multi-sport and adventure racing sock. If you want to run in deep snow and/or cold air you will really like the Bridgedale socks, which are warmer than their Smartwool counterparts. Last, but not least… A big thanks to the Bridgedale representative who found my first review and was kind enough to provide three pairs of new socks at no cost or obligation! Generally I’m an afternoon runner, but this morning I woke up at 5:30am to enjoy a nice run at dawn. What a morning! The air temperature was already 71 degrees despite the sun still being asleep. There was enough light to not need a headlamp, but I wore my taillight for any drowsy motorists. My dog Haven came with me, outfitted with her own Bling Bling Blinker to alert the drivers. We had a great run! I chose my pace at random – sometimes I ran hard, sometimes easy, and sometimes at just a moderate cruising pace. The wind was blowing quite fast – a rarity for early morning hours – but that’s probably why the air was so warm: a heated mass of atmosphere was being drawn across the area. Haven and I awakened some snoozing ducks and geese along the river, including some fuzzy goslings. It wasn’t all smooth sailing – the warm temps brought the bugs out early. I was forced to swallow one bug (ew!) and another got stuck in my eye. Nevertheless, after half an hour on the streets Haven and I were more than content with our dawn run! Last weekend I ran in the Road Ends Trail Run and despite achieving my goal, I noticed that my leg speed just wasn’t there. Thursday I hopped on a treadmill to get a feel for my stride rate (steps per minute) and sure enough, my recent lack of training had slowed my legs down a bit. Yeah, speed work is good. 7:00 pace = 8.6 mph, 6:00 pace = 10.0 mph, a difference of 1.4 mph! Looks like I’m pretty consistent; if I can improve another 5 energy units to 40 that puts me at a 6:19 pace, which would pass my goal of running a 20:08 5K (a 6:30 pace). One way I can see an analysis like this helping runners in training is to provide more achievable goals. As we train and improve, initial results are going to come quickly as we cut large chunks of time off our race performances. If we expect such improvements to continue at a linear pace then we’ll only become frustrated. For example, my second 5K was two minutes faster than my first; however, I should not expect my next 5K to be two minutes faster than my last one. This may seem ironic but the faster we get, the “lower” we should aim our sights for the next goal. Try it out! How fast were you running when you first got started, and how fast are you now? How many “energy units” is that? If you maintain the intensity of your training, you could expect a similar improvement in “energy units”. Of course the human body has limits to its energy output, which makes running faster even more difficult than just the physics of energy and speed! You are currently browsing the Why Run? 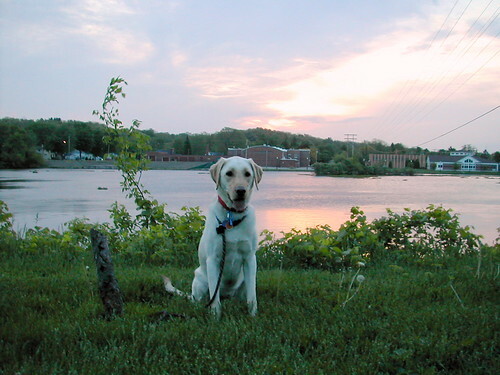 blog archives for May, 2007.